Amplo e com metros quadrados suficientes, o atelier Sedimento, criado em 2017 por Maud Téphany e Úrsula Duarte, é um co-work exclusivamente vocacionado para a cerâmica. Além dos workshops e das bancadas para residentes, Sedimento é uma marca com qual as duas assinam quando trabalham juntas em projetos exclusivos, do fine dining para a decoração de interior. Licenciada em Design Gráfico e Web. Formou-se em cerâmica em 2012. Desde aí, desenvolveu projetos como “Red Balloon” – série de balões suspensos (inspirado na obra de Albert Lamorisse – Le Ballon Rouge, 1956) ou “Ice Cream” – uma instalação de 100 gelados pendurados numa parede, apresentada no âmbito da Experimenta Design 2015. Recentemente, participou na concepção e instalação de peças de cerâmica suspensas no tecto do restaurante “Bairro do Avillez“. Licenciada em Arquitectura. Aprendeu cerâmica em 2014 no atelier Caulino Ceramics, onde, em 2015, começou a trabalhar. Gosta de criar peças utilitárias e monocromáticas. Produziu, recentemente, uma série de copos em grès para o restaurante “Euskalduna Studio“. 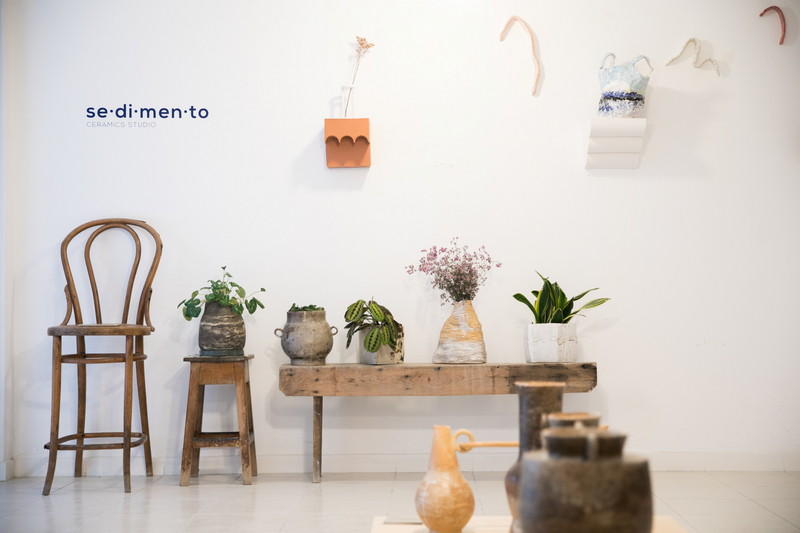 Sedimento Ceramics studio was initiated in March 2017 by Maud Téphany and Úrsula Duarte, as a creative space where experience and research are combined to create original ceramics and other artistic projects. The studio offers short- and long-term workshops year-round for adults and children, beginners or experienced. 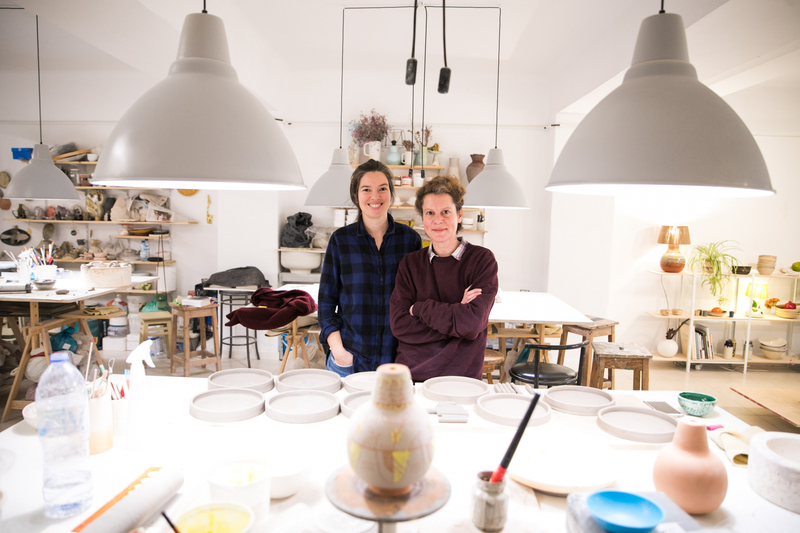 Participants can create ceramics around a theme, a technique, or any other personal aspiration. The studio and equipment are also available for short- to long-term (annual) residency for artists who wish to develop their artistic projects. Maud Téphany originally graduated in Graphic and Web Design. She has been fully dedicated to ceramics since 2012, developing projects such as “Red Balloon” – a series of suspended ceramic balloons inspired by the movie “Le Ballon Rouge” (Albert Lamorisse, 1956) – or “Ice Cream” – a wall exhibit of 100 ceramic ice creams as part of the “Experimenta Design” 2015 edition. Maud’s recent projects include the suspended ceramic artwork displayed on the ceiling of the “Bairro do Avillez” restaurant in Lisbon. Úrsula Duarte graduated in Architecture, and trained in ceramics in 2014 at the Caulino Ceramics studio, where she started to work in 2015. Her main interests revolve around monochromatic objects designed to be of practical use. She recently created a set of stoneware glasses for the “Euskalduna Studio” restaurant in Oporto.